Brighton & Hove Albion could take a huge step towards Premier League safety with victory at home to Bournemouth tomorrow. The Seagulls are 16th in the table and five points clear of third-from-bottom Cardiff, who they entertain at the Amex on Tuesday. Albion have lost three successive games and host a Cherries side who have won just one of their last nine league matches. Bournemouth beat Brighton 2-0 at the Vitality Stadium in December, while Albion knocked the Cherries out of the FA Cup 3-1 in January on route to the semi-finals. 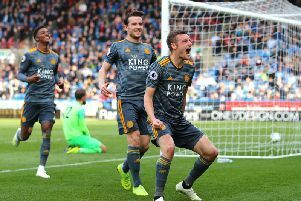 Albion will hope to have Pascal Gross (hamstring) and Solly March (calf) back available after the duo both missed Saturday's FA Cup semi-final with Manchester City. They are both back in training but would likely be on the bench if selected in the squad. Brighton pushed City all the way at Wembley and Seagulls boss Chris Hughton is unlikely to make too many changes, although he will have one eye on Tuesday's home game with Cardiff. The back four and midfield trio are likely to remain the same but Hughton could opt to start Florin Andone up front against Bournemouth. 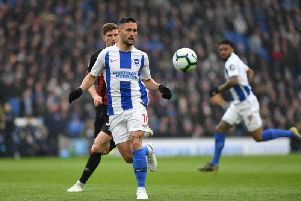 Anthony Knockaert is likely to continue on the right-hand side of Albion's front three after being named man-of-the-match against Manchester City, while Jurgen Locadia and Jose Izquierdo will be pushing Alireza Jahanbakhsh for the left-hand side role. Likely line-up: Ryan; Montoya, Duffy, Dunk, Bernardo; Stephens, Propper, Bissouma; Knockaert, Andone, Jahanbakhsh. Subs (from): Button, Bruno, Bong, Burn, Balogun, Kayal, Izquierdo, March, Gross, Locadia, Murray. The Cherries have won just one of their last nine Premier League games and Cherries boss Eddie Howe says his side are still not yet safe from relegation. They are 13th in the table, five points clear of Brighton who are five points above the relegation zone. Charlie Daniels, Andrew Surman, Simon Francis, Lewis Cook and Diego Rico are all out and former Albion defender Steve Cook is not due back from a groin injury until the end of the month. Joshua King and Callum Wilson are likely to lead the line at the Amex, although Dominic Solanke will be pushing to make his third start since joining from Liverpool in January. David Brooks and Ryan Fraser have impressed on the wing this season and are likely to start ahead of Jordon Ibe, Lys Mousset and Junior Stanislas. Asmir Begovic has returned in goal in place of Artur Boruc for the Cherries' last two games. Likely line-up: Begovic; Clyne, Mepham, Ake, Smith; Brooks, Gosling, Lerma, Fraser; King, Wilson. Subs (from): Boruc, Mousset, Ibe, Solanke, Stanislas, Simpson, Taylor, Surridge.